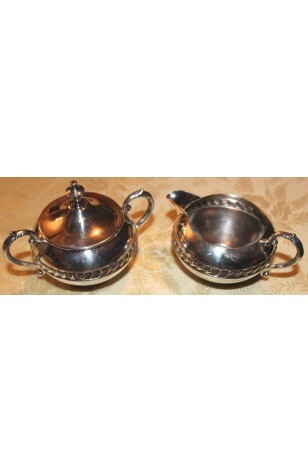 Vintage - Sheridan Company, Silverplated, Sugar Bowl with Lid and Creamer in Pattern #SDN10 - Circa 1944. This Beautiful Sugar Bowl and Creamer are both in good condition. However, does show slight use, considering they are 70 Years Old. The Pattern is a Ring of Tear Drops around both the Sugar Bowl and the Creame. This Beautiful Sugar Bowl and Creamer are both in Good Resale Condition unless noted below or in pictures. However, does show slight use, considering they are 70 Years Old. The Pattern is a Ring of Tear Drops around both the Sugar Bowl and the Creamer.